The Ultimate Bucket List Activity! This is the ultimate activity for the boys. It is crazy fast furious and wet. This is something that not many people get to do but want to. Yes, this is right it is your chance to not just challenge yourself but also the river as well. 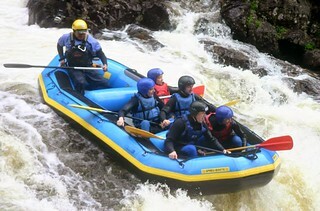 We use the best rivers in Highland Scotland for this sport and with a full instructor you will head down these powerful rivers on an oversized inflatable. We love rafting because you'll experience the ride together with your friends, share a lot of banter and be scared, excited and at times wonder at the beauty. This really is a MUST DO activity, if you have never done it before, OK the rivers are in the Highlands so there is about a 90 min drive but it is really worth it. Get up early & also combine it with Canyonning. Where can you try White Water Rafting? We use four major rivers in Scotland for rafting depending on the amount of rain and the river swell; they are the Tay, Tummel, Orchy and Garry. The rivers have different graded routes so if you are beginners don’t worry as we will start you off on the easy grades and move you up as the afternoon develops. The great thing about using out sites is that it is very easy to combine activities to get a full day such as canyonning, river bugs, cliff jumping, motor sports or even highland games. 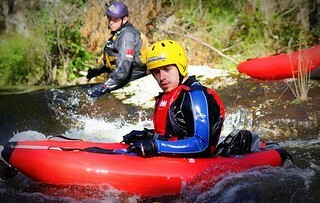 Rafting is available to any one over the age of 14 who can swim a min of 25 meters confidently and are fit and well. There is a strict weight limit of 16 stones all safety and guide costs are included in the price. The rafting lasts for two hours and each raft holds 6 people and there are four rafts availability for larger groups. This is the best activity if the group wants to do something as it lasts a good 2 and ½ hours you have great fun but also you can see the improvement over the day. The other attraction is that it is so close to other activities so you can organise a day of rafting and then go on to highland games or cliff jumping. Don't drink to much whisky as it is strong stuff.